Their colour scheme is orange, so I set about an orange version of Matilda. 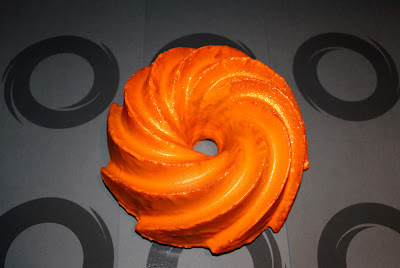 I originally planned to just dye the inside of the cake orange, but found orange glitter whilst I was there. Then once the cake was made, I decided that perhaps the cake itself would benefit from a splash of colour...? Matilda got her dancing shoes on and painted the town (and my kitchen) orange! It was an absolute (fitting eh?) nightmare to cover in icing, but the finished product had a certain 'slapped in the face with a slab of glittery bundt' look about it. It was literally drenched in glitter!